Belize has long been recognized as a mecca for sport anglers.Â A number of exclusive vacation lodges, both on Ambergris Caye and more remote cayes, cater to dedicated saltwater anglers. All types of fishing - spin, fly, and trolling - can be experienced all year long.Â Tarpon, snook and jacks are found in the estuaries and inlets.Â Near the coral reefs one can find groupers, snapper, jacks and barracuda.Â The lagoons and grass flats are known for bonefish, permit and barracuda.Â The deeper waters, beyond the reefÂs drop off, are where the sailfish, marlin, bonito and pompano reside. 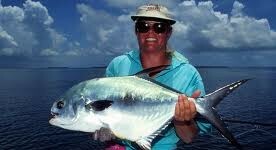 This tournament quickly gained recognition.Â It has become an international anglers event. 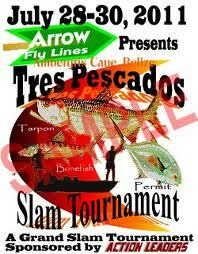 This year the third annual tournament will be held on July 28-30, in San Pedro Town.Â Of course, the initial organizers intention was to bring business to Ambergris Caye.Â But, they also wanted to bring much needed attention to BelizeÂs catch-and-release law for tarpon, bonefish and permit. So what, you may wonder, is a ÂGrand SlamÂ?Â Â An angler achieves the coveted Grand Slam status when he or she, through much skill - and some luck, is able to catch (and release) all three of these elusive fish in a single day.Â Since many fly fishing anglers visit Belize trying to achieve this level of angling prowess, the catch-and-release law is critical to sustainable fishing. If you are an angler, why not consider signing up and coming for this exceptional tournament.Â If not this year, then plan for July of 2012...Â The purse for the winning team this year is $10,000.Â By joining the tournament, youÂll also help to promote sustainable sport fishing in Belize.Â A portion of the fees collected are given back to programs such as the Conservation and Management of Sport Fishing Program, in Belize.